Here is the stamp that started my little stamp making adventure. Johanna of justjohanna rubber stamps ran a contest among her designers to create a stamp to use on the back of cards and other creations. While I didn't win (there were so many amazing creations), Johanna liked it well enough to turn it into a rubber stamp! The idea behind it is for the artist to sign and/or number the creation in the center of the oval. I made some card samples using just the floral portion of the stamp. Playing with it this way led me to create sketches of more floral stamps. The new floral stamps are wider, fuller and more detailed than the handcrafted stamp. They are also much easier to use than inking a portion of a smaller stamp. I feel so blessed to have this opportunity. Thanks Johanna!! Stamps are justjohanna "Auntie Stu" and "Handcrafted garland". Paper is Basic Grey Lily Kate. Miss you tag is by Making Memories. Stamps are justjohanna "Thanks ever so" and "Handcrafted garland". Paper is Basic Grey Lily Kate. 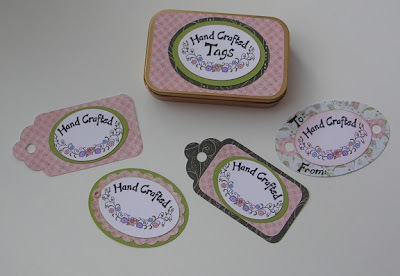 A set of tags for handcrafted items. The tag box is made from an Altoid tin. These are all gorgeous samples!! Great creations...love the pink and the black! Very elegant, creative & inspirational! That stamp deserved to be turned into rubber! !